“Arise, shine, your light has come!” was the theme of the 2018 gathering of the Presbyterian Women of the Presbyterian Church (U.S.A.), which was held in Louisville, KY, during a four-day stretch of August. The triennial event celebrates and attempts to deepen the engagement for all that Presbyterian Women does. The gathering includes workshops, tours, forums, resource gathering, plenary sessions with inspiring speakers and worship, among other things. A group of Presbyterian Women from the Synod of the Trinity listen to J. Herbert Nelson speak during the national PW gathering in Louisville in August. The Presbyterian Women’s 2018 Churchwide Gathering was an awesome experience. It was attended by over 1,650 ladies and their families from around the globe. There was great fellowship, worship, music, workshops, Synod luncheons, activities, resources and so much more. Our opening plenary was presented by Philadelphia’s Executive Presbyter Ruth Santana-Grace. It was amazing and well received. She also delivered two workshops. 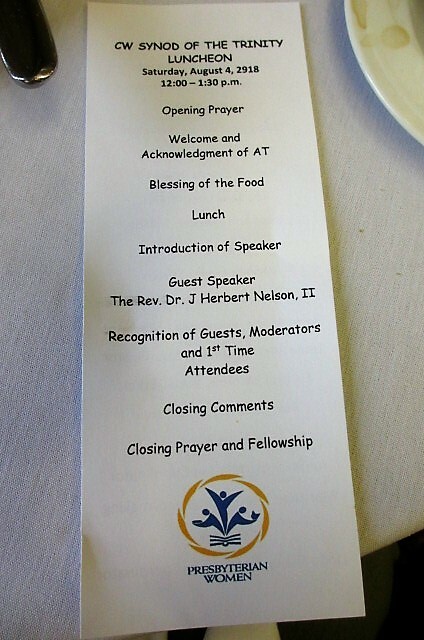 Our Synod had a luncheon that was attended by over 75 people. Our speaker for the luncheon was Rev J. Herbert Nelson. Our Synod Mission Project for this year was Lily’s Place (West Virginia). They received $20,000 for their project working with babies that were born with addictions. There was also a march as part of the gathering to address the effects of racism and discrimination practices of redlining that have resulted in segregation in Louisville and so many other cities and towns across the nation. There were 47 ladies that participated in the Presbytery Disaster Training. These ladies were from around the United States and Puerto Rico. It was such a great opportunity to meet women of like faith from so many different places. And the fellowship and love shared for the mission projects that Presbyterian Women have stood for over the last 30 years was celebrated and embraced. It is an awesome and humbling experience to attend a PW gathering. We encourage more ladies to join us in the future. And we ask that you stay tune to our next activity coming up soon. I had the privilege of being the voting representative for the Presbytery of Northumberland at the triennial business meeting of Presbyterian Women this summer. I also was able to attend the gathering. Frequently, people don’t look forward to business meetings, but when Presbyterian women meet there is always a tone of expectation and possibility. This year was no exception. The opening worship was led by Rhashell Hunter, Director of Racial Equity & Women’s Intercultural Ministries, Presbyterian Mission Agency. Our second day Diane Moffett (president and executive director of the Presbyterian Mission Agency) kicked off the morning by exhorting us to “Rise up so new stories will be told. Rise up despite the barriers.” Jesus calls us to rise up for justice. Later that day, J. Herbert Nelson II, stated clerk of the General Assembly of the PCUSA, challenged us to be bold, as did our PW leaders. Of course, all our business was covered, the new slate duly elected, budgets approved, by-laws revised, and reports were given from our global partners and associates. One item of business that was referred to the board of directors for consideration and action was a resolution that PW become active in fighting injustice of sexual and gender-based violence. Ruth Santana-Grace, the executive presbyter of the Presbytery of Philadelphia, opened plenary with a message centered on Exodus 3:7-8 “God’s call to Moses,” saying God sees, knows and will come to restore us. She also issued a call to action. In her message she said, “We need to be building bridges, not walls. We need to embrace all people and affirm everyone’s uniqueness… be a voice for the voiceless and break the silence surrounding abuse and violence against others.” I will confess that I was feeling proud that one of our Synod of the Trinity women, a “first woman and person of color to hold the office of executive presbyter in the 300-year history of the Presbytery of Philadelphia,” was the kickoff speaker. The speakers each day were inspiring and at times convicting as we learned about youth mission, homelessness, immigration issues and inclusivity. The next two Bible Study leaders introduced the future studies; Eugenia Gamble (2019-20) “Love Carved in Stone” and Lynn Miller (2020-21) “To You They Cried.” Over 350 Presbyterian women and other racial justice allies marched to highlight the “Ninth Street Divide” focusing on the racial and economic divide that exists in so many cities in the U.S.
Greg Fischer, mayor of Louisville, thanked the PW for coming and for lifting up such an important issue, and J. Herbert Nelson II offered a prayer as marches started out. At the midway point they learned of the economic disparity between the East and West Ends of Louisville. More than 1,600 women gathered and with the various offerings and opportunities contributed over $83,000. We were introduced to our new moderator, Jyung In Lee; Vice Moderator for Justice and Peace Joy Durrant and Vice Moderator for Mission Jo Ann Burell. In her message to us, Jyung In claimed she is our first moderator with a New Jersey Korean accent. Gatherings consist of wonderful music, singing, prayer and praise, workshops to challenge, inform and give rest for the soul. 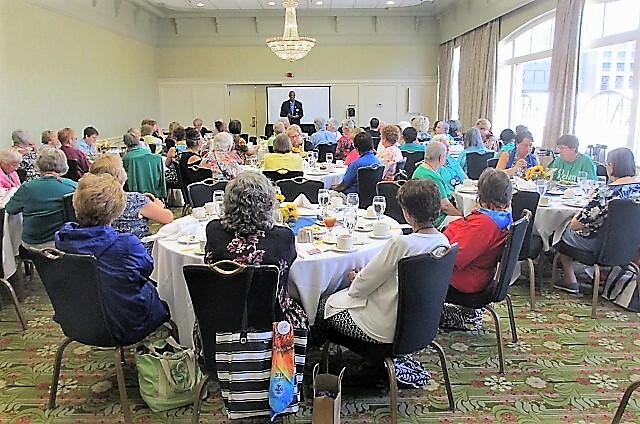 This gathering featured a look back at our 200 years plus history as well as celebrating the 30-year anniversary of Presbyterian Women when the southern Women of the Church (WOC) and the northern United Presbyterian Women (UPW) joined together. The 1988 gathering at Purdue University was the first combined meeting. I was there and have not missed one since. After 30 years, it can feel more like a family reunion than a meeting. There is joy in coming together with sisters from across the U.S. and beyond, some known to me, others not, but none are strangers. From the opening worship to our closing communion service we were surrounded by love. As I headed for home I felt encouraged and inspired to arise and shine for indeed we know that our light has indeed come!